These are field recordings by Voyager I & Voyager II. "Altough space is a virtual vacuum, this does not mean there is no sound in space. Sound does exist as electromagnetic vibrations. The specially designed instruments on board of space probes included plasma wave antenna to record the vibrations used here, all within the range of human hearing (20-20.000 cycles per second). This decoded information can be heard when played over a speaker system. 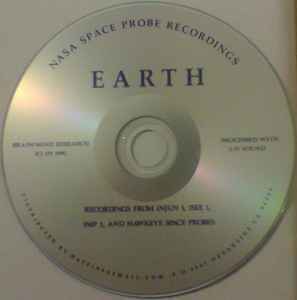 the real space sound recordings." I guess this only is the sound of the voyager does in space ! How a space machine like that can be that silent to record without any interference the planet's vibrations ? Plus there's no air in space so any eventual sound activities has no way to evolve in waves succession. Plus i guess real space vibrations totally comes out of our hearing range... so these tracks are result of editing for a reasonable music medium that cut the original Hertz vibes, (if this mesure can apply in space). Sound is pressure wave and is usually represented by frequencies, but sound is not the only wave out there. Nasa recorded plasmawave (so, not sound) from space, and then "converted" it to sound simply by assuming the data they had at their hands were recorded pressure wave (sound). No other analogy or conceptual idea is/was needed. To make the specific songs of this album, some artist got those converted recordings and used effects on it to turn into a more musical thing. Very interesting release. This is not just another typical ambient music release - because the music component includes actual sounds from space. Tune in as Voyager spacecraft travels at thousands of kilometers per hour through endless space. As it goes, it intercepts vibrations, perhaps even a vibration from a distant galaxy or a distant supernova remnants. An entirely different listening experience. You feel more connected to space and to the universe. Sends chills down your spine (if you listen to this using high quality headphones). "Miranda" and "Jupiter" are the best tracks. Overall a neat package! Since 5th September 1977 Voyager is flying through space. Voyager II has started already 16 days earlier but was put on a different trajectory. The Voyager probe is considered the greatest success of NASA because it has exceeded its planned life expectancy far and is still regularly sending data to Earth. She is also the farthest object from the earth that was built by humans at all and will keep this status for the foreseeable future too. Voyager I is able to record electromagnetic vibrations that can be converted into acoustic signals. And this fancy box is now the result. Each planet / moon is characterized by its unique sound but all with a beautiful and dark background noise. One can feel the cold of space formally. A five-hour trip through our solar system. Simply divine and absolutely authentic. A must for all lovers of Field Recordings.